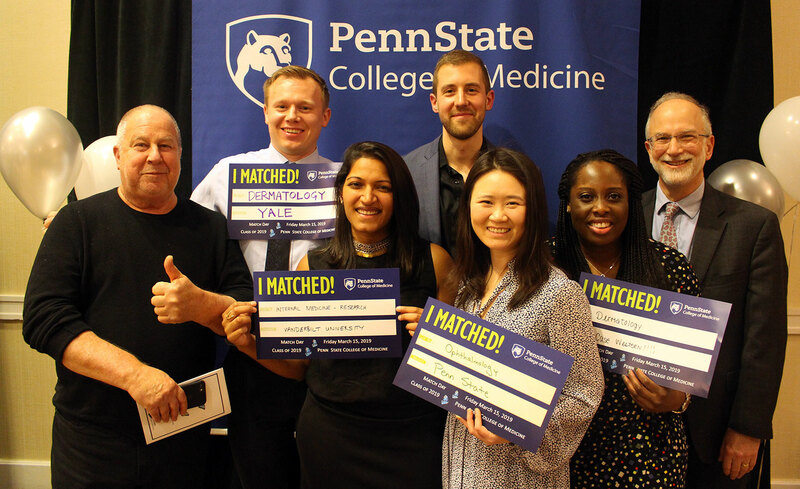 Students from Penn State College of Medicine's MD/PhD Medical Scientist Training Program received their residency locations during Match Day 2019. Pictured are, front row from left, Dr. Robert Levenson, MD/PhD program co-director, Saumya Maru, Amy Lu, Akua Sarfo, and Dr. Aron Lukacher, MD/PhD program associate director; and back row, Michal Kidacki and Oliver Mrowczynski. MD/PhD student Kimberly	Breglio, not pictured, also matched. Six Penn State College of Medicine MD/PhD Medical Scientist Training Program students received their residency destinations during the March 2019 Match Day celebration, ripping open envelopes to see the hospitals where they will continue their medical training under the supervision of attending physicians. The Match Day event marked the culmination of a process that began months ago as students visited and evaluated residency programs – while the programs simultaneously evaluated them. It coincided with similar Match Day events at medical schools across the country. See the full Match Day 2019 story and photo gallery here.